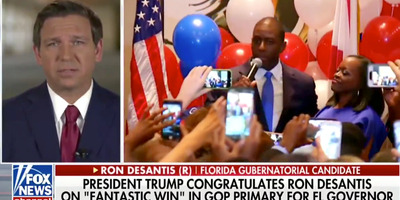 Fox NewsRepublican congressman Ron DeSantis spoke about Tallahassee Mayor Andrew Gillum on Fox News. GOP Rep. Ron DeSantis spoke about his rival in Florida’s governor’s race, Tallahassee Mayor Andrew Gillum, to Fox News on Wednesday morning. Gillum could become Florida’s first black governor if he wins the election in November. While speaking to Fox News about Gillum, DeSantis warned that a far-left agenda could “monkey” up Florida’s politics. He also used the words “articulate” and “charismatic” to describe the left-wing Democrat. GOP Rep. Ron DeSantis called his black rival in Florida’s governor’s race, Tallahassee Mayor Andrew Gillum, an “articulate spokesman” and warned that the state may “monkey up” its politics by electing a “socialist agenda” into office. 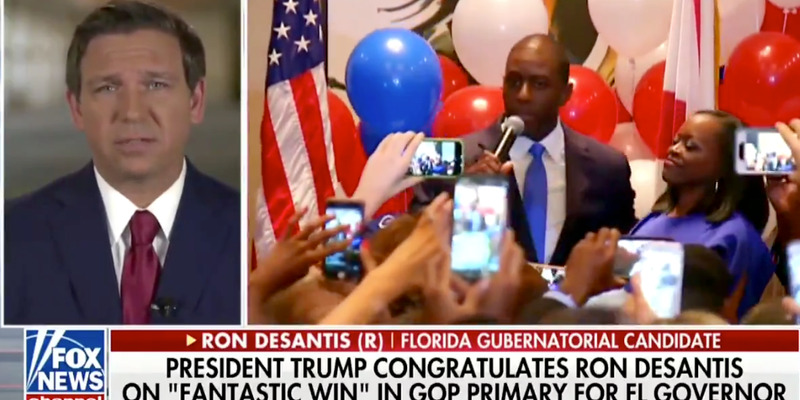 In an interview with Fox News’s Sandra Smith on Wednesday, DeSantis, who has been endorsed by President Donald Trump, spoke about Gillum in a segment following his Republican primary win. He said: “The last thing we need to do is monkey this up by trying to embrace a socialist agenda with huge tax increases and bankrupting the state. If Gillum wins the gubernatorial election in November, he would become Florida’s first black governor. DeSantis’s campaign manager, Steven Lawson later clarified the GOP candidate’s remarks in a statement. He said: “Ron DeSantis was obviously talking about Florida not making the wrong decision to embrace the socialist policies that Andrew Gillum espouses. To characterise it as anything else is absurd. In a later segment of her show, Fox News’ Sandra Smith condemned DeSantis’s choice of words. On Tuesday, Gillum beat out five other Democrats in the primary. The field included US Rep. Gwen Graham, who was hoping to become the state’s first female governor, according to the Associated Press. Gillum was backed by Vermont Sen. Bernie Sanders and won the hearts of progressives across the state with a grassroots campaign that stayed away from big donations and TV ads. He and DeSantis are competing for the office held by Gov. Rick Scott, who cannot be re-elected due to term limits. Scott is instead challenging Democratic Sen. Bill Nelson for his seat in the Senate.